About Tricot Fabric - Fabric Depot Co. Fabric Depot's 40 Denier Nylon Tricot (FT300...) is first quality fabric that has been made in a mill located within the United States. It is 100% "nylon 6" multi-filimant yarn. All of our 31 colors of tricot are dyed from the same greige goods that have been created by warp knitting. There is approximately 50% stretch widthwise (from selvage to selvage) and 5% stretch lengthwise in the fabric. In the "yoga and circus world" it is referred to as a "low stretch" fabric. The fabric is dyed using a leveling acid dye. Our 40 denier Nylon Tricot was created to be a lingerie fabric. It has been adapted for use by Aerial Trapeze Artists and Yoga Studios for the past 21 years. Our business is built on giving top quality service to over 13,000+ customers worldwide. Below is a website that has tested our 40 denier Nylon Tricot for strength. Tricot 40 denier fabric is a minimal-to-no-stretch knit fabric lengthwise. Fabric Depot's 40 denier Tricot is made of 100% Nylon fibers and manufactured in the United States. Sizing Dots are NOT considered a "defect" in any way, and are part of the normal manufacturing process. 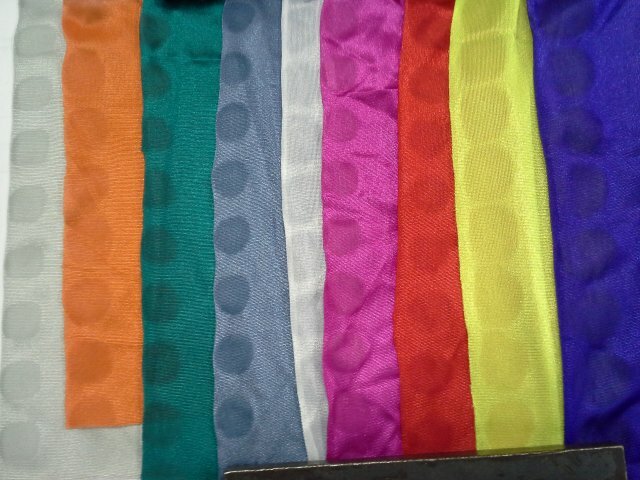 “Sizing Dots” or "Glue Dots" are put on every yard of our 40 denier nylon tricot by the US manufacturing mill. These are put down the selvages of the fabric to keep the edges from curling. They tend to show up on some colors more then on other colors. These are temporary and will eventually wear off and disappear with use and laundering. If you want to speed up the “disappearing process”, you can wash and dry the fabric several times (using our washing instructions) and it will hasten the process. See image to the right. Fabric Depot and its employees are committed to ensuring only the best fabric leaves our shop. Our fabrics are checked multiple times by multiple people throughout the order process to ensure only quality fabric is sold. 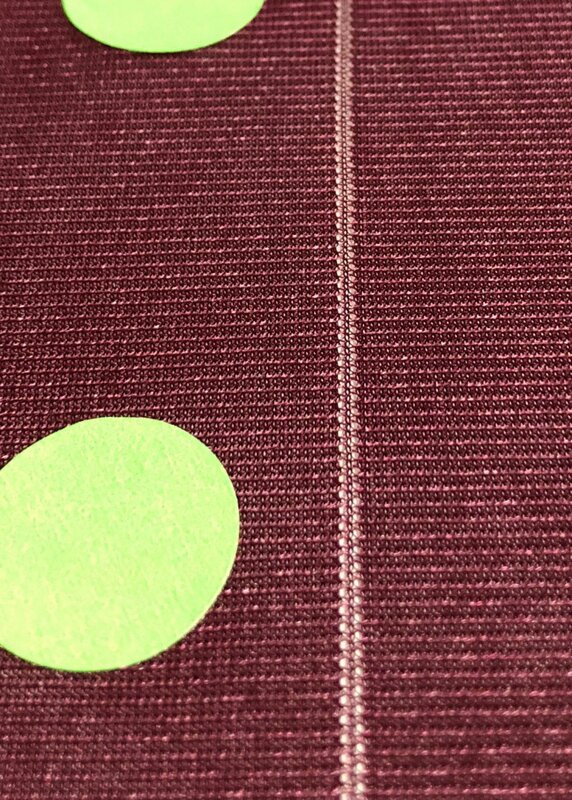 An example of what qualifies as a manufacturer defect in Tricot, 40 denier, is in the image to the right. This is called a "dropped stitch" and happens during the knitting process. Abrasions and snags can occur in in any textile. Activities that involve clamps, rigging, high friction, heat and extended sunlight exposure, velcro, finger nails, and jewelry can damage any textile and nylon tricot is no exception. This type of fabric damage is not a manufacturer defect. Please check each piece thouroughly upon the orders arrival and contact us immediately if you feel there is a problem with your order. Example of Manufacturer "Dropped Stitch" or "Runner"
You can safely wash about 20 yards (110" wide) of 40 denier nylon tricot fabric in most home washing machines (only 1 color at a time). Use plain Tide washing powder - NO fabric softener or bleach. Use "COLD" water rinse with "gentle" spin cycle. Untangle fabric and put in dryer for about 20 minutes on "genle/warm" with "cool down" end setting. Take out the "almost dry" fabric, untangle it, and put it back into the dryer for about 10 more minutes until completely dry. Immediately after drying, take fabric out, untangle it, fluff it up a bit and you are ready to attach it to your apparatus for use. DO NOT HANG TRICOT FABRIC WHERE IT IS EXPOSED TO DIRECT/INDIRECT SUNLIGHT SINCE THIS WILL CAUSE COLOR FADING. Fabric Depot's 40 Denier Nylon Tricot, manufactured in the USA, is a lingerie fabric used by Aerialists for aerial "silks" training and performances. iI is also commonly used for yoga hammocks. Both of these activities require specialty equipment and professional training for personal safety and equipment longevity. Clamps, rigging, and friction can damage or degrade fabrics. Jewelry, acrylic nails, and abrasive clothing can also cause damage to the fabric. It is important to open orders immediately upon receipt and fully inspect each piece of fabric prior to use. ALWAYS seek training with a professional artist or instructor for personal safety.